FutureTouch Technology - Portfolio Details For Sheetz, Inc.
Sheetz contracted with FutureTouch to develop an in-store interactive solution to solve their problem of finding qualified employee prospects in a difficult job market. They also needed a convenient method to provide real-time employee policy and benefits information to employees at the store locations. 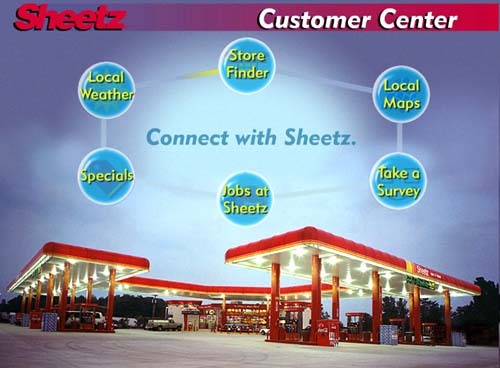 The Sheetz marketing department was also interested in using an interactive system to promote specials, collect customer satisfaction data and to provide information services to their customers. FutureTouch created an interactive kiosk solution based on FutureTouch EyePoint and Guardian Kiosk network software and the FutureTouch EyePoint Survey and Geographic Mapping plugins.